Welcome to Pet Travel Tales! Hope you came bearing treats. The dog takes anything from veggies and fruit to traditional doggie treats. Or eggs, or meat. Or toys. The human is easily appeased with coffee. We believe that humans and pets make for wonderful travel companions and lead to epic travel tales, hence this blog! Ares the Dog and the human(s) he is overlord to have been traveling together for a long time. Years! Which means practically forever for a dog. As his human later found out, traveling with Ares comes with great difficulties. 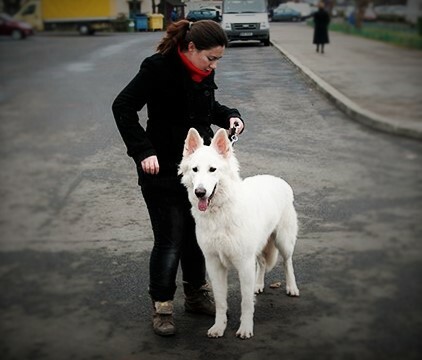 No, the dog is a pleasure on the road, but finding a place to stay with a huge dog like this playful White Swiss Shepherd? Not so much. We’ll explore pet friendly hotels, things to do when you travel with your pet, and hopefully get together a valuable list of pet friendly travel ideas. For those times when you have to leave your pet behind, we have our Pet-free travel section. You know, business trips, a well deserved break to just enjoy yourself. Yeah, those human-only trips that will make you feel guilty for a long, long time. Especially if your dog gets a little sick while you’re away! Either way, it happens, and we want to explore the pleasure, the worry, and yes, the shattering guilt of traveling without your furry friend. We welcome comments, tips, personal experiences, and recommendations. First because we’re interested, second because we both love the attention. Ares mostly in the form of petting and treats, his human in the form of lots of traffic and interactions. Yup, marketer at heart, what can you do? Read on to find out more about Ares the dog and his human, or, if this is introduction enough for you, just skip the pages and move on to the actual blog. Want to Get in Touch with the Pet Travel Tales Team? We’re a friendly team at Pet Travel Tales so feel free to reach out whenever you need to. If you want to suggest us topics or approaches, places to explore, or anything travel or pet related, we welcome it. If you want to share your own experiences as a guest author, we’re happy to talk about that. If you’re pet friendly hotel, coffee shot, playground, or beach and want us to check you out, we’re more than happy to chat with you. Regardless of the reason, feel free to use our contact details and drop us a line.